God continues to do big things–through your prayer and support–for children and families in Haiti. Yesterday morning at 9:00–under a bright blue sky, surrounded by friends and family–a group of believers decided to publicly proclaim their faith by becoming the first (ever!) 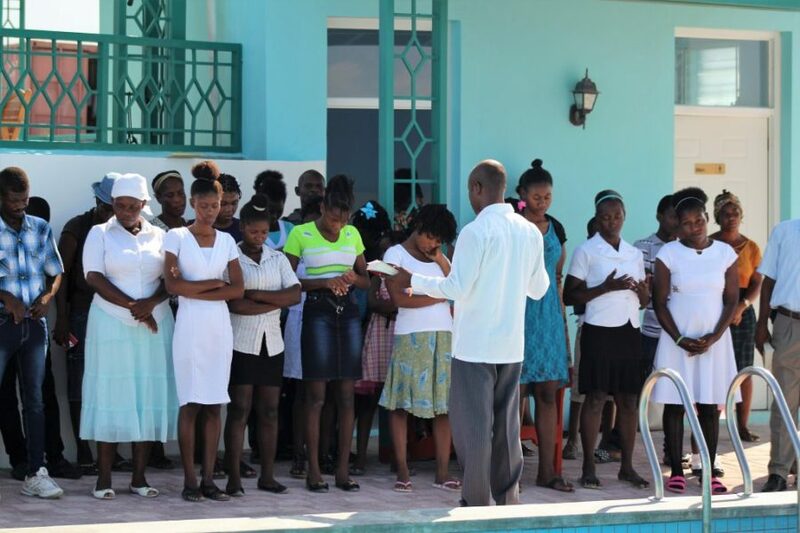 group to be baptized at Lifesong Haiti/MBO. Imagine the joy and excitement as each person entered the pool–dressed in his or her best clothes–to meet Pastor Octavian. Friends and church members in the crowd sang hymns of praise throughout the entire baptism. One woman baptized–Alerte–has 7 children and has been excited to grow in her walk with God. (She can be seen in the first photo with the mint headband, white shirt, and black skirt.) 3 others who were baptized are students who live in the family residence. The rest have been faithful church attenders who saw their need to obey God with a public profession of faith. Following the baptisms, everyone enjoyed a time of fellowship in the guest house kitchen with food and coffee. Thank you for praying for the work in Haiti. God is answering your prayers in BIG ways through the faithfulness of His people. Every child in Haiti needs to hear the Gospel.